France is the most visited country on the planet with over 89 million people enjoying trips there every year. Of course Paris is where most travelers start their journeys in France, and who could blame them. The City of Light has inspired poets and artists for centuries. But venture out of the capital, to the regional French cities, and you discover the country’s diverse history, culture, and of course food and wine. Exploring her cities is how I cemented my love affair with France, and I’m here to help you do the same. We asked fellow travel writers and photographers to nominate their favorite urban places around the country. Here are 30 of the most beautiful cities in France to visit – inspiration for your next trip! Paris needs no introduction – except to say, if you can, you must go there once in your lifetime. It is, without a doubt, the world’s most beautiful city. The City of Light is an intoxicating mix of grand boulevards and cobbled streets, iconic monuments and secret nooks. In Paris there is a treasure trove of art, old and new. You can spend hours browsing quirky bookshops, elegant arcades and vibrant produce markets. For me, Paris is relaxing on striped deck chairs in its grand gardens, riding on vintage carousels and dining in bohemian cafes. But my favorite thing to do in Paris is to simply wander and enjoy the city – somehow watching at sunset from on high. Just the thought of the city bathed in pink light with the Eiffel Tower looming above the rooftops gives me goosebumps. For these iconic views, head to the rooftops at Le Printemps and Galeries Lafayette after shopping on Boulevard Haussmann. Looking for a perfectly Parisian place to stay? We love Hotel Adele et Jules – a luxury boutique hotel in the 9th Arrondissement. Lyon is the capital city of France’s Auvergne-Rhône-Alpes region and while Lyon is France’s largest city after Paris, it’s relatively “undiscovered” as many travelers skip Lyon when planning their France travels. Lyon dates back to the Roman Empire and you can not only see, but feel, the 2,000+ years of history in the city, which has earned it’s spot on the UNESCO World Heritage List. If hoping to chase down some Roman Ruins – you’re in luck! Visit the Musée de la Civilisation Gallo-Romaine – where you can explore the Gallo-Roman-era antiques including ceramics, statues, coins, mosaics, vases and more. The museum also boasts not one, but two Roman theaters – which are the oldest ancient Roman ruins in France. If hoping to visit some old things – you can’t miss the Quartier Saint-Jean, the old town, of Lyon with quaint, narrow cobblestone lanes and Renaissance architecture. For an authentic feel you can step back in time and stay at Cour des Loges, a Renaissance-Era themed five-star property. While planning your visit in the Old Town, make a plan to sit back, relax and taste some of the infamous Lyonnaise Cuisine. Lyon’s culinary history dates back to the Roman era when the geographical location of Lyon made it the perfect place for wine traders to stop on their routes from Italy, Greece and Crete through France. These traders also brought Mediterranean ingredients and flavors to Lyon – giving the chefs of Lyon experience in many types of cuisine. Today, Lyon is home to over 100 Michelin Star restaurants and has definitely-earned its title of The Gastronomic Capital of France. Nestled along the border between Germany and France, the Alsace region is one of the most charming cities in France. Having changed hands throughout history between the two countries, Strasbourg, set along a beautiful riverside lined with a plethora of half-timbered houses straight out of a fairy tale book, displays both French and German influences. The town has that big city feel to it, yet when meandering cobble-stoned alleys, still holds that small town coziness to it. Strasbourg is a popular destination for those looking for somewhere to go outside of Paris either for shopping, sightseeing, French cuisine or the city’s famous Christmas Market. Its Gothic cathedral attracts visitors for its unique pink-hued stone and amazing panoramic view from its lone tower while others are drawn to the charm of Petite-France – an old half-timbered district lining the canal, decorated in a plethora of flowers and bikes. For those looking to indulge in mouth-watering French cuisine, look no further than Au Dauphin in the heart of the city center. When planning a visit to France, we highly recommend putting Marseille on your travel itinerary as one of the must-see cities in France. Marseille is the second largest city in this beautiful country and offers the traveller a diverse cultural experience. Staying at the luxurious Intercontinental Marseille – Hotel Dieu, you will be within easy walking distance of the top things to do in Marseille. Take a short stroll from the hotel through the narrow streets of old Marseille, and you will soon emerge at the impressive Byzantine Cathedrale La Major. Make sure you visit the stunning new building of the Museum of Civilisations on Promenade Robert Laffont. And nearby you will discover Fort Saint-Jean offering views over Port Vieux and to the fabulous Palais du Pharo. A perfect place to stop for a coffee and to people watch is Port Quai, alongside the old port. While there you may contemplate whether to take a taxi up to the Basilique Notre Dame de la Garde or a cruise to the Chateau d’If. Whatever the choice, the views will be fantastic. To finish the day, enjoy Cafe Simon on Rue de la Paix Marcel Paul for fabulous seafood dishes, accompanied by a French Rosé. We think you will agree, Marseille is one of the must-see cities in France. Beautiful Bordeaux in south west France is the gateway to the wine region of the same name and the perfect escape for lovers of food, fresh air, art and of course wine. Situated on the Garonne River, Bordeaux is a compact and elegant city with wide boulevards and restored neoclassical architecture. Make sure to walk along the river banks and stop by the Place de la Bourse where a water mirror captures the reflection of the 18th century architecture. The banks of the Garonne is also where you will find a lively weekly produce market where you can taste the freshest oysters from nearby Bay de Arachon. Food is never far from your mind in Bordeaux as the city has many world class dining options. At Brasserie Bordelaise, steak of the highest quality is on the menu – perfectly matched to the local wine. Make sure to save some room for the local sweet delicacy – canelés – sticky pastry flavored with rum and vanilla hiding a gooey custard centre. Wine lovers should not miss La Cité du Vin – a wine museum created to celebrate the history, skill and passion of winemaking. You can also easily take a tour of the nearby Médoc and St Emillion wine regions. At Le Boutique Hotel Bordeaux you can continue your wining and dining in the hotel’s bar and soak up the atmosphere in the UNESCO listed building where Victor Hugo once stayed – read our full review of the hotel here. 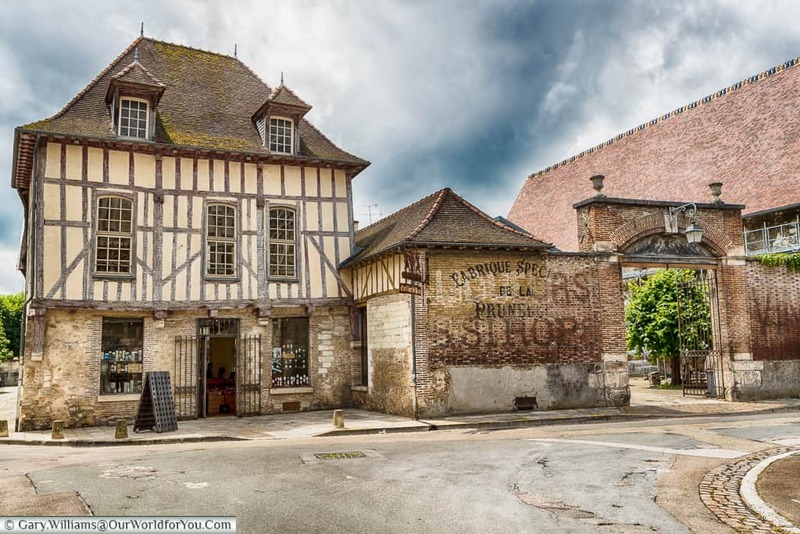 Troyes is nestled in the south-west of the Grand Est region of France, and its terroir is famous for a little-known bubbly drink named Champagne – ok, ok, so some of you may have heard of it. Not only is Troyes an ideal location to base yourself from, to tour the Champagne houses and vineyards, it is also steeped in so much history. Amongst its cobbled streets and little lanes, there are beautiful examples of 16th-century half-timbered homes, that certainly could tell a story or two. What we loved about Troyes is that it was such pleasant town to stroll around, particularly along the quayside that runs by the Canal du Trevois. It’s home to an impressive Cathedral, elegant buildings and some delightful cafes and restaurants; you’re spoilt for choice. Troyes has some interesting local delicacies to enjoy with you Champagne, however, beware of Andouillette de Troyes (local sausage) it’s not for the faint-hearted. One of the prettiest places in Normandy, Honfleur is a harbour city at the mouth of the Seine River in the north of France that inspired artists Claude Monet and Eugène Boudin. Colourful buildings line the old port known as the Vieux Bassin. Here bars and restaurants spill out onto the street allowing diners to enjoy the spectacle of yachts and fishing boats entering the harbour. Of course the specialty is seafood and you can try the local moules (mussels) and delicious fish soup at many of the restaurants. The drink of choice in this part of the world is cidre (cider) made from local apples, so be sure to taste that too. Beyond the harbour, discover the picturesque old town where half-timbered houses line narrow cobbled streets. These passageways lead to the beautiful Eglise Ste. Catherine, a wooden church dating from the 15th century. A city of markets, Honfleur has one for everyone. From produce markets to brocante and antique, you could spend hours simply browsing for treasures. Just an hour away by train from Paris, Rouen is a great city to explore for one day or a weekend. It was a major city during the Roman Empire and the Middle Age. And you can feel the History as you wander around the old paved roads of the pedestrian town centre, from one beautiful building to another. You can find a full one-day itinerary around Rouen here. Rouen offers many squares where you can enjoy food and drinks on a terrace like the popular Place du Vieux Marche and the more relaxed Place de la Pucelle. If it fits better with your itinerary, Eau de Robec road is lovely and a great stop for food too. It can be a great idea to spend the night in Rouen, especially when they do a light show on the Cathedral during summer. You’ll want to find a place near the town centre so you can easily walk everywhere. The city of Amiens is the Hauts-de-France region of northern France and home to the imposing Basilique Cathédrale Notre-Dame d’Amiens. The gothic cathedral is a UNESCO world heritage site and the biggest cathedral in France. The main facade is decorated in intricate carvings and inside the ancient Rose Window casts a kaleidoscope of colours across the interior. In summer and in December “cathédrale en couleurs” lights up the cathedral. The city also hosts one of Frances’ biggest Christmas markets. The city is divided by the Somme River and canals flow through the city. The medieval St-Leu area or ‘quartier’ with its network of canals and brightly painted houses are just a few minutes’ walk from the cathedral. The quaint streets are lined with galleries, boutiques and bookshops. Across the canal Quai Belu buzzes with restaurants, bars and cafes selling a variety of local favourite dishes and cuisine. Floating market gardens called ‘hortillonnages’ can be explored by boat. Maison de Jules Verne is a museum in the quirky house where the author lived and wrote some of his novels. Samara Parc, a living prehistoric museum, is just a few minutes’ drive from the city and makes a fascinating family day out. Hotel Le Prieuré et La Résidence is a characterful hotel in an excellent location in one of the oldest streets in the city. I first became interested in Cherbourg because of its connection to the Titanic, the second last port visited before sailing off into history and legend. For those interested in the Titanic, head to the Cite de la Mer maritime museum, here you will find displays on the Titanic, an aquarium and an oceanography museum. You can also get a glimpse into the life of a submariner by exploring the submarine Le Redoutable. Cherbourg is still a thriving seaport for international ferries and cruise ships. For those meeting up with cruise ships or ferries the Hotel Mercure Cherbourg Centre Port is a short walk to the cruise terminal and the delights of the Les Eleis shopping mall. Cherbourg is a pretty city for walking but if you don’t want to walk you can explore the city by horse drawn carriage or take the Cherbourg city tour on the tourist train. If you like gardens the Parc Emmanual Liais is a real treat with over 400 species of plants from locations across the globe. Amid this oasis of greenery will find a small museum which houses curios from all over the world, lovingly collected by Cherbourg’s former Mayor Emmanual Liais. Cherbourg is full of culinary treats, from fresh crusty baguettes and mouth-watering pasties from local boulangeries and patisseries, to first class French cuisine from Le Plouc 2 restaurant where you can choose from their delicious set menus. All these attractions are why Cherbourg should be on everyone’s list of best cities in France. It takes a little bit of time to get used to the way Le Havre looks. To put it mildly, it’s unique. To put it more bluntly, it’s bizarre. But it’s the design of Le Havre that makes the city one of the most interesting in France. The reason Le Havre looks so non-traditional is because the whole centre of the city is built in concrete. Severely damaged after the Second World War, the city was rebuilt with a cohesive feel. It’s full of enormous buildings all designed at the same time with a brutalist feel – but also with a warmth that makes it welcoming, and colours that make it playful. Just walking the streets of Le Havre is interesting enough, but there are also some particular sights worth seeing. Try to find some time to visit Appartement Témoin to see the interior of a typical residence, go inside the stunning church of St Joseph, and check out the impressionist art collection at Musée Malraux. When it comes to dining, the Quartier St-François area has the best selection of restaurants. But there are also quite a few good food options along the beach that are a nice casual option. Antibes is a beautiful town on the French Riviera. Located between Nice and Cannes, it is often skipped over on the way to it’s more famous siblings. This is a shame as it’s definitely the prettiest sister. Antibes has a gorgeous old town surrounded by 16th century ramparts. It’s a beautiful place to take a stroll, eat, shop and explore. Even on a busy day, it’s not hard to find some private laneways and to get somewhat lost in its centre. Other than just soaking it all up, you can also visit the harbour to see mega yachts and Musée Picasso located in Chateau Grimaldi where Picasso once lived. The food market in Cours Massena is also worth a visit. If sand and water is more your thing, there are also sand beaches that are very popular in summer. There’s also a theme park, Marineland, just outside of Antibes if you are travelling with kids. However, the best part about Antibes is definitely just soaking it all up, walking around and eating at tiny bistros. 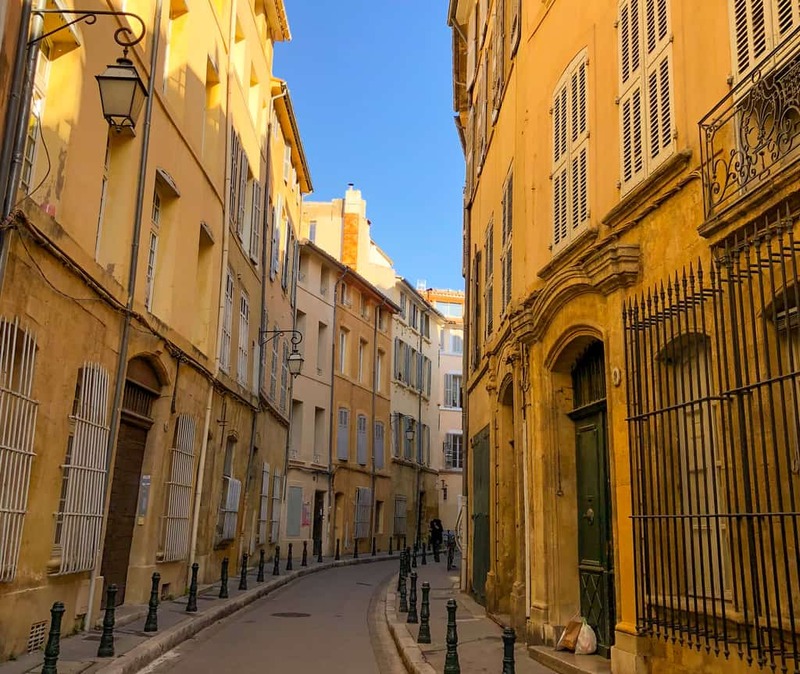 Aix-en-Provence – known simply as Aix by the locals – is, in my opinion, the most beautiful city of Provence. It has all the allure of a hilltop village, on a grand scale. But despite its dignified appearance, you’ll find none of the Parisian haughtiness here. In Aix, it’s all about the joie de vivre the South of France is famous for. Aix is very much rooted in the cultural landscape of Provence, with many famous artists living and creating there throughout the years. Museums, galleries and historical places are peppered throughout the city, including Paul Cézanne’s studio, Musée Granet which hosts some of the finest collections in France, and Hotel de Caumont which is a haven for art lovers. Other attractions not to be missed are the colourful and vibrant markets that take place most days throughout summer (only slightly less often in the cooler months), the café-lined Cours Mirabeau, and the old town with its interesting and eclectic mix of eateries and boutiques. I’d recommend staying central – perhaps at the iconic Hôtel Aquabella set within the old town walls – as Aix is wonderfully walkable and best explored by foot. The elegant city of Avignon in Provence is recognised as an important historical city thanks to several UNESCO sites. The city was home to a series of popes in the 14th century, after the French crown quarrelled with the papal court in Rome. Though short lived, the papal crisis brought good fortune to the walled city. During this time the impressive Palais des Papes (Palace of Popes) was built and it is now one of the city’s major attractions. Inside you learn about the city’s unique history and view many priceless frescoes by French and Italian masters. Outside the palace, the Pont St-Bénezet, also known as the Pont d’Avignon juts out into the River Rhône. Once an important stop on the pilgrimage routes from France to Spain, the bridge is now incomplete due to the collapse of half of the supporting arches. After seeing the sights, head back into town and make your way down medieval streets and past Renaissance mansions until you reach the town square. Here you eat at one of the many wonderful restaurants like La Salamandre. These days Avignon is famous for its annual arts festival in July – Festival d’Avignon – just another reason to spend a few days in this beautiful French city. Toulouse is an absolute can’t miss city when visiting France. I wasn’t necessarily expecting it, but it’s charming as any city I’ve been to. The theatre in the central square known as the Capitole de Toulouse is downright magnificent, and it doesn’t hurt that off of the theatre is a square filled with lively restaurants and bars. Just to ensure that it fits all the requirements of a gorgeous French city, Toulouse has an imposing cathedral. The Basilica of Saint Sernin is lovely both inside and out, and well worth the walk through Toulouse’s narrow, alluring streets. As if it wasn’t pretty enough, the Canal du Midi ensures that Toulouse needs to be on your “must visit” list when it comes to France. You can take a tugboat down the middle of the canal, or bike along, appreciating all the lush greenery that surrounds the canal. It’s perfection. Toulouse is charming, has wonderful food, and a history worth learning about. If you’re headed to France, it’s a safe bet to impress. Nice is one of our favourite cities in France to visit. Whether you’re looking for romance, party, or just plain good old fashioned tranquillity, Nice has got you covered. The city is best known for having one of the largest carnivals in the world, which originated in the Middle Ages as a festival authorised by the church, allowing anyone wearing a mask to safely ridicule those in power: anyone without a mask got flogged with stockings filled with flour. One of our favourite things to do in Nice is to walk down the “Promenade des Anglais” beach front. It’s beautiful and very romantic. The Old Town of Nice is also a lot of fun to explore, full of old buildings and cobblestone little streets. The best restaurants can be found in the Old Town. One thing to try is the Nicoise food – a unique and delicious mix of French Mediterranean with Italian. Montpellier was a city I didn’t know that I would love, until I was there. I was on a motorbike trip around France and was aiming for the South because my foodie tendencies send me on quests to eat dishes in the area in which they originated. I was on a mission to locate Aligot, but unfortunately I couldn’t stay in the L’Aubrac region so Montpellier was the next best thing. 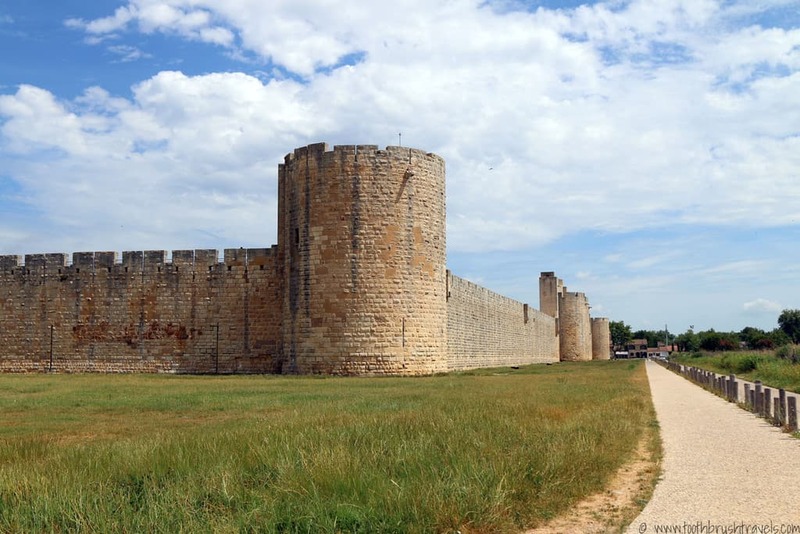 charming commune known as Aigues Mortes. homes, places to eat and beautiful architecture. Plus, there’s a pink lake and flamingos are plentiful in this area of France; so that alone is worth a visit! An historic city in the Loire Valley, Orléans owes much of its fame to its emancipation led by Saint Joan of Arc during France’s 100 Years War with England in the 15th century. Only 120km from Paris, the city holds a strategic position on the Loire Valley and the battles here were a turning point in that war. If you are interested in learning more about St Joan’s history, there is a small museum in a house where she once stayed that shows a 15 minute presentation about her eventful and tragic life. Pay your respects at the many statues honouring Joan in Orléans. The most impressive is in the the place du Martroi where you can take a break in one of the many restaurants and cafes or browse the Friday food market. Dishes local to the area feature game from the nearby forest of the Sologne, fish from the Loire and mushrooms from the caves near Saumur. All matched with the famous local wines, naturally. If you like art there are several museums and galleries worth visiting – the best, the Musee des Beaux-Arts collection, includes Van Dyk and Picasso. Orléans is often used as a base to explore the chateaux of the Loire Valley. The closest is Château de Meung sur Loire, one of the oldest and largest in the region. Bourges, is quite literally the heart of central France. Surrounded by rolling hills covered in wine grapes and cider apples, castles, and quaint homes, this small university city houses a wealth of sights and things to do. The enormous gothic Bourges Cathedral towers over the town, and while it’s not for the faint-hearted, climbing the Tour de Buerre offers one of the best panoramic views of Bourges. Recover from the climb with a slow stroll along the winding Yèvre River, stopping into the many colorful manicured gardens including the Jardin des Pres-Fechaux. Or wander through the mixture of tightly stacked two story diamond patterned half-timber homes, mansions, cute shops, and restaurants in Downtown Bourges. Another not miss, is the Musee du Berry (founder of Bourges), the Natural History Museum or one of the half a dozen museums. If you’re in town on Saturday, don’t miss the farmer’s market for delicious treats! The town of Chartres is about 50 miles from Paris and home to the Chartres Cathedral and a great day trip from Paris. The Chartres Cathedral is a 12th century gothic cathedral that is a UNESCO World Heritage Site. The Cathedral is considered to be one of the most beautiful with its mismatched spires (one dates back to the 12th century and the other to the 16th century) and stained glass windows and it demonstrates all of the gothic features. The stained glass was removed during the Second World War as a precaution against the destruction of war. But don’t only come to Chartres for the Cathedral it is also worth a walk around the town and the preservation zone. It’s a really cute city and the buildings and streets date back to the 1800s. I loved walking along the pebbled pathways and crossing the quaint bridge there and stopping for coffee and an éclair at Au Bon Croissant de Chartres. A popular day trip from Paris, the city of Versailles is of course the home of France’s most famous chateau. The main attraction drawing visitors is the Chateau de Versailles and its impressive gardens, however it is a large city in its own right and is worth exploring further. You can start by simply walking through the streets where you notice architecture unique to this part of France. The Carrés of Saint-Louis are small houses originally built to house market stalls during the reign of King Louis XV. The covered and open air markets of Versailles are well worth visiting. Open every day except Monday, the covered market is one of the largest in the region. It’s the perfect place to pick up cheese, a baguette and fruit for a picnic lunch in the palace grounds. Wander the cobbled streets of Versailles and you will discover boutiques, beautiful churches and antique stores. If it is too cold for a picnic then the city has several excellent restaurants including Gordon Ramsay’s fine diner at The Waldorf Astoria Trianon Palace. Now wouldn’t that be a regal place to stay. Driving over the Swiss border, we were instantly enchanted by Annecy’s colourful medieval architecture with the star attraction Palais de l’Isle looking as if straight from a fairy tale. We had been informed by Swiss friends that the town is often nicknamed “ a mini Venice” and upon arrival we instantly understood why. Narrow cobbled streets intertwined canals dotted with swans and foot bridges, admittedly so quaint we found it far more charming than Venice and far less crowded! Our room for the weekend was in Atipik Hotel Alexendra, offering a modern yet homely vibe within walking distance of the mouth watering patisseries. You cannot leave Annecy without trying the traditional fondue overlooking the canal. Then hiring a bike for a relaxing cycle round Lake Annecy to admire yet more beautiful swans and of course work off all that cheese! Historically known as the home of the Dukes of Burgundy – meaning, wine, music, and art in Medieval France – it’s rich in Dijon is rich in history and all things tasty. Flats in the city center – the best place to be – are affordable and lovely, and the city is very walkable. Dijon is internationally known for its mustard, but beware when you try it at Edmund Fallot’s mustard bar – the real deal will light up your sinuses! Dijon is also known for its authentic gingerbread, so be sure to pick up a few moulots, and tour the factory while you’re there. For history, look no further than Dijon’s Owl Trail, a self-guided tour of the old city, marked by brass plaques; or the impressive Ducal Palace, now home to an impressive array of modern art and medieval tapestries, religious art, and weaponry. And to top it all off? Take a tour of Burgundy wine country – a magnificent region full of historical significance and very tasty beverages. Most people go to Reims for the cathedral and the champagne houses (not necessarily in that order) and both are well worth it. But the city has other gems worth checking out too during a day visit. Dwight Eisenhower directed U.S. troops and accepted Germany’s surrender from his base here during WWII; that headquarters is now the Museum of Surrender and worth a visit for anyone interested in modern history. If it’s Wednesday, Friday or Saturday you can head from this small museum to the Halles du Boulingrin indoor market for a coffee and late-morning snack. Also on the outskirts is the Reims Automobile museum with 230 cars including some very rare gems. Once you hit the center of town, stop by the visitor’s center to book a visit to a champagne house. If you only have time to visit one, choose Taitinger for its endless underground cellars and stylish tasting room (and excellent champagne). Before getting tipsy, though, visit the cathedral to appreciate its stained glass windows by Marc Chagall and Imi Knoebbel and discuss whether these modern treasure do or don’t fit their ancient home. It’s easy to find a good lunch in the city center, to window shop and to enjoy a last glass of bubbly before catching your return train to Paris at the end of the day. Grenoble is one of our favourite cities in France, sitting amongst the mountains in South eastern France it is surrounded by beauty. The city is over looked by La Bastille, an 18th century fortress, that you can visit via unusual bubble shaped cable cars. Grenoble is also where the first unrest started leading to the French Revolution, so has an important link to the France we see today. There is also some foodie history with the city hosting France’s second oldest coffee shop, Cafe de la Table Ronde. Founded in 1739, it is still serving both coffee and regional specialties to this day. From Les Ravioles de Royan tasty little parcels of local cheese and herbs served in a broth to the salty blue cheeses to the walnuts grown in the area there is something to whet everyone’s appetite. Grenoble really is a wonderful addition to any tour of France and should not be missed. Brest, the western port town with one of the most beautiful natural harbours in France, is a successful blend of the ancient and modern. Medieval Château de Brest houses the Musée de la Marine depicting 17 centuries of history and across River Penfeld, Tour Tanguy begs a visit. Continuing with a marine theme Oceanopolis Aquarium and the International Maritime Festival held every four years with its tall ships, luxury boats and historical replicas shouldn’t be missed. Admire art at the Musée des Beaux-Arts and search for marine treasures in the arty quarter before relaxing over a traditional Breton meal and glass of wine at the popular Bistro Globulle Rouge. We also suggest heading inland to wander around the luscious Jardin du Convervatoire Botanique National de Brest. We are sure one trip to Brest will not be enough. As the capital of the beautiful Dordogne region and with history stretching back over 2,000 years to the Roman times, Perigueux is one city that must be on your list to visit if you’re in this part of France. Situated on the banks of the Isle River, there is a great deal to see and do here. A highlight is of course the domed and turreted Saint-Front cathedral, a UNESCO world heritage site with parts dating from the 10th century. This cathedral’s design was later to inspire the Sacre Coeur on Montmartre. Perigueux also has a fascinating Roman and medieval history. There are a number of structures dating from Roman times, including a tower and an amphitheater. There’s also the Gallo Roman Vesunna Museum, which was built around the remains of a Roman villa, and showcases mosaics and many other features of a roman villa, including the underfloor heating system. There’s no shortage of accommodation in Perigueux. I’d suggest staying fairly central so you can walk everywhere. Central options include the Bristol Hotel Perigueux or the Mercure Perigueux Centre. If you’d prefer to be a little out of town, take a look at the L’Orangerie du Château des Reynats. For dining, look no further than the Michelin starred Restaurant L’Essentiel, one of the Dordogne’s best restaurants. Located in the estuary of the Loire, Nantes not only has a rich heritage but is also a vibrant and creative city. It is also known for its excellent quality of life which makes it one of the best cities in France. The city has an extremely walkable historic centre made easy by an ingenious 15 kilometre long trail to help visitors explore Nantes. Follow the city’s famed green line to Les Machines de l’Ile and explore the magical world of Jules Verne by riding the mechanical great Elephant or the marine worlds carousel. Continue on the trail to the medieval district and take a stroll along the cobbled streets to the Castle of the Dukes of Brittany, the Saint Peter Saint Paul Cathedral and the Jardin des Plantes. To take a rest from sightseeing, grab a drink at Le Nid and take advantage of the panoramic view over the city. For a taste of Nantes gastronomy, dine at La Cigale while gazing at its art nouveau style. Don’t leave Nantes before shopping at Passage Pommeraye or grabbing one of Nantes’ sweets at Les Rigolettes Nantaises. La Rochelle is one of the most beautiful places on the west coast of France, a historic port city in the Charente region and a great base to explore the beautiful Bay of Biscay coastline. It’s known as La Ville Blanche, the White City, because of its limestone buildings which sparkle brightly in the ocean light. It’s a wonderful place to linger and luxuriate for a few days. The Vieux Port, or Old Harbour, is the most atmospheric place in the town, especially in the evening when the restaurants and bistros are busy and buzzing with life. La Rochelle is one of the main fishing ports on the Atlantic coast, so you know what to expect on the menus – seafood, a huge variety, and everywhere we went, outstanding. One of the main concentrations is around the Tour de la Chaine and Tour St Nicolas at the entrance to the harbour. La Rochelle old town is also lovely, much of it dating from the 14th to the 17th centuries when the port was at its peak. One of the pleasures of this area is exploring the many arcades between streets, which also date from this time. The city is also the jumping-off point for the Ile de Ré, a long, flat, sunny island full of fine sandy beaches and ideal for cycling. Biarritz is the main city on the west coast of France along ‘La Cote des Basques’, which is a bit like the Cote d’Azur. Only the massive yachts and ridiculous wealth have been replaced with a laidback atmosphere, making it a mecca for surfers and seaside sports fans. As with most seaside cities tourism in Biarritz centres around the coastline promenades, and Le Grande Plage (the big beach) which is the main beach of the city. 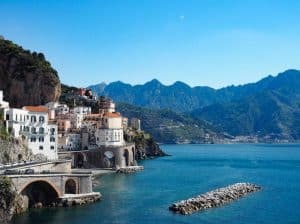 However there are many attractions away from the sand including elegant seafront architecture – the Hôtel du Palais, and the two large casinos at Barrière and the Bellevue and some ridiculously picturesque coves and bays along the shoreline – Rocher de la Vierge. Accommodation-wise the forest camping experience is extremely popular on the nearby coastlines, although I personally go with the rather stunning seafront hotels along the central promenade of the city like the Hotel Windsor Grande Plage. Biarritz is best reached from either Bordeaux or Toulouse, the main French cities nearby, although the actual closest city is in fact Bilbao in nearby Spain. A direct crossing with Brittany Ferries from Portsmouth takes you to St. Malo, the Brittany coastal city that represents one of France’s most underrated destinations for sure. Ideal for a long weekend away due to its easy access and also an ideal family friendly location too. Accommodation at the Hotel Le Nouveau Monde with a balcony view over the beach could not be more ideal. Furthermore, is there anything more Breton than the local oysters which you can certainly get a helping of at many of the restaurants in the old town offering outdoor seating. The St. Malo Aquarium is perfect for all ages and as long as the tide is low, dipping your toes into the little rock pools and venturing towards the little island fortresses will take you back to those bucket and spades holidays of your childhood. A day trip to the well preserved medieval town of Dinan or to the fantasy like Mont St Michel are also possibilities for your itinerary too. And whether at sunrise or sundown or any time in between, just walking a full circuit of the old city walls overlooking the streets within or the channel in the distance is very contemplative. Aren’t these beautiful French cities incredible? Which will you choose to visit on your next trip to France? Disclosure: this post contains affiliate links. All opinions and obsessions with France are our own. Please visit our disclosure page to read our full affiliate policy. So many wonderful places! This definitely makes me want to return to France. We used to nip over a lot pre-kids from the UK but we’ve only visited once in the last 5 years. I’d love to go to Lyon for the food and I’d definitely like to return to Bordeaux for the same reason! Thank you for letting me participate and share Strasbourg! You’ve collected a wonderful list of places in France I seriously need to start visiting! I don’t know why we keep traveling East and not West! Beautiful places that you can only find in France!